Thick, wavy hair frames an oval face. Strong cheek bones, firm jaw. Dark, almond-shaped eyes. Defined musculature; good posture. Being an Englishman one would usually expect him to be pale, however, thanks to living his entire life in Florida he has developed a mild brown tan. He has no noticeable physical ailments and is in perfect health. Millwood usually wears black when he is off duty but otherwise prefers the standard Starfleet uniform because he thinks it looks professional and requires all crew members to wear it while on duty. Serious and quiet, interested in security and peaceful living. Extremely thorough, responsible, and dependable. Well-developed powers of concentration. Well-organized and hard working. Selective hearing. Able to fade into the background in crowded situations. Began ballroom dance lessons while in attendance of the boarding school and continues training through holographic programs. Yoga. Meditation. Container gardening. Historical documentaries. Sikora Mauli was a single mother raising two of her four children. The two youngest boys lived in the sole custody of their biological fathers while she raised her eldest son and daughter. Working in retail, she earned marginally more than minimum wage, yet managed to keep her small family functional. Assistance from friends in the form of babysitting and some food also helped. When Isis was eight, trouble began in school. Her concentration was lax, her scores were down, and friends were in short supply. Concerned, her teacher held Isis after class one day, despite the child’s protests of “But my mom’s gonna kill me!” That night, Isis ran home, an hour late, and with a teacher’s note pinned to her jacket. She paused at the police tape-line wrapped around the tree in front of the apartment complex she lived in. One of the neighbors, on the same side of the tape as her, gave her a sympathetic look which spurred her on to race through the tape. After a lengthy trial, Sikora was sentenced to life in prison without parole for the death of her son, Lud. Lacking a known biological father, Isis became a ward of the state and entered into the foster system. For three years, she was shuffled between families until finally being settled into a boarding school. Her education was overseen by a private interest investor. With a regimented course schedule, it didn’t become clear who this investor was until Isis was entered into the Initiate program. Instead of a lottery system or having the chance to select a symbiont of her choosing, the symbiont had chosen Isis as a host. For this reason, Isis was joined at thirty years of age, whereas most host are in their early to mid twenties at the time of joining. 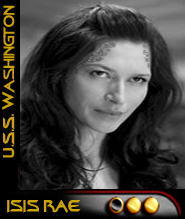 Isis was encouraged to enter Starfleet Academy where she worked her way diligently through the training and was able to find prime opportunities for advancement once beginning her service in the fleet.